In hot pursuit of the chance to win a pair of trips to Paris (one for me AND one for a Lipglossiping.com reader – ooh la la! ), I’ve been given the opportunity to guess the new flavour (from an unbranded tin) and decorate my own Lip Therapy tin, using the hints they sent as inspiration! So, without further ado (and because my fingers are partially still super-glued together)… I’m very proud to show off my decorated tin! Presented with a variety of hints which included: a pink candle (cupcake optional), a champagne flute filled with bubbles, a pink balloon, and a box of champagne truffles, it didn’t take me long to notice a bit of a theme. I mean, it’s like a doggy bag from a Barbara Cartland party isn’t it? Pink is the colour… but what is the flavour? 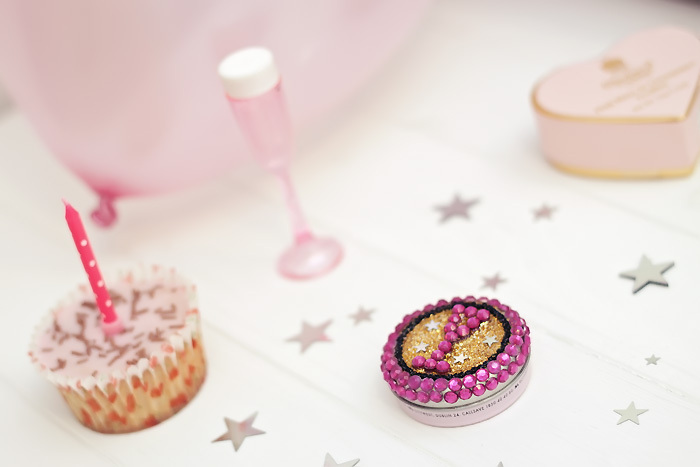 I chose to decorate my tin with a sparkly base of gold glitter and stars to embrace the obvious glamour abundant in the clues. The motif could only be one thing for me, a champagne flute! If you turn it upside-down, it also looks a bit like the Eiffel Tower right? RIGHT? Come on girls, we want that trip to Paris! I finished my decorations by studding the edge with pink diamantes and black seed beeds (about a billion of them, which I will be hoovering up forever more). 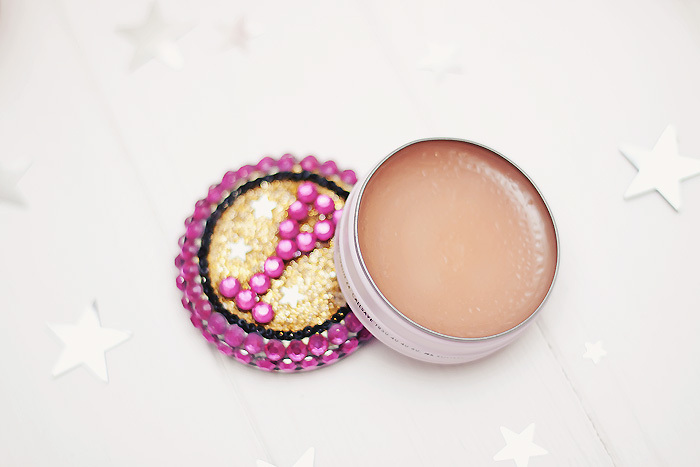 Which leaves me with only one thing left to say… my guess for the new Limited Edition Vaseline Lip Therapy flavour? 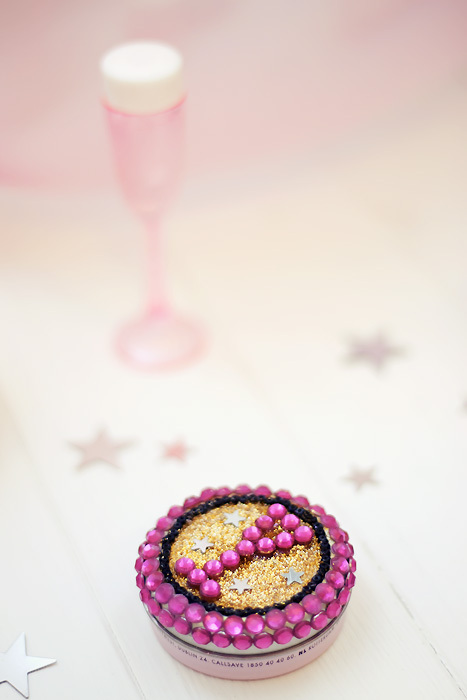 It’s girly, fizzy, glamourous, and it makes you do silly things when you’ve had a glass too many! It’s the perfect antidote to a lacklustre evening and should be compulsory at all parties. If I’m right, I’ll even put some red food colouring in my White Lightning to celebrate. What flavour do you think would make the perfect Limited Edition scent? In a straw poll of my living room – one said “toad in the hole”, and the other said “Quavers”. Let’s stick with Pink Champagne for now shall we? If you want to keep up with the latest clues on the new flavour, head over to the Vaseline Facebook page for hints and updates. Oh my, that is absolutely adorable! I’d totally buy that! How did you manage to fit it all on the lid of a tiny vaseline tin?!! Good luck with the competition and I can’t wait to try the new flavour myself. Oh crikey, that does look amazing! love the pink and gold.. get you! It’s got to be pink champagne, this is easier than last year’s! I loved the Crème Brûlée idea, though I never got around to trying it. I would like a tingly sweet cinnamon swirl flavour – a Danish kanelsnegle in balm form. I’ve tried one cinnamon balm (by Hurraw) but that was too spicy. Mojito sounds good too! Hi, your site could badly do with a redesign, dark grey for a site about makeup? grey! I mean really.. really? really… c’mon now. That’s some effort gone into it there. Best tub of Vaseline I’ve ever seen. Good luck, it looks really good, most thoughtful one I’ve seen too! I’m heaving at the though of Quavers-flavoured vaseline though, can you imagine?! My choice would be (following with the alcohol theme) Pina Colada – yum! Ooooh yummy! Pink Champagne! That sounds awesome! I think you’re right with Pink Champagne… I wonder what it’s going to be like. I am coming to the end of my first pot of Creme Brulee, but it’s okay because I have 5 more fresh tins stashed away because I am addicted to the stuff! Maybe I can add a pot or two of this new one so that I have something else as a backup! Congratulations on your win. So happy for you!! I absolutely love your design – I genuinely wish they had used yours – it’s so much more glitzy and appropriate for the product. Congrats on your win again! !